I’ve had two county meetings and two diagnostic assessments to get through in the last week and a half, in the midst of both of my children with Autism being in a deep valley of negative behavior, social limitations and sensory struggles. There’s been more time spent navigating screaming meltdowns in the past two months than we’ve dealt with in years and our entire family feels beaten, in the trenches. Will she ever have friends? Will he always scream at me when I slip up and do his bedtime routine out of order? I wonder if they feel less-than as they watch other kids their age breeze through skills that they may never master… Will I be healthy enough to take care of them when they’re adults still living at home? Am I giving everyone enough one-on-one attention? Will I ever go back to being able to relax and think clearly? Will they be able to hold down a job someday? What if someone takes advantage of her? Can I trust this agency not to abuse him? Are they getting enough intervention with the therapies we have them in? Can we really make it through that social event on our calendar? How will they handle the bullying? How will I stop her from bullying me? Does she love me? Does he understand that I love him? Between the realities of our situation and the thoughts taking over my exhausted mind, I easily make the mistake of focusing on the negative and, therefore, sinking. I do have clinical depression and, outside of these extra difficult Autism phases, it’s manageable with medication. Yet, when the kids begin to spiral, so does my mood. The stress causes me to unravel, both physically and emotionally. I spend more and more of my time feeling less and less in control. It’s here, in this chaos, that God gently reminds me that I never was. He’s in control. Always has been, always will be. If my faith didn’t weaken during our time in the trenches, I would be able to hold on to that truth more securely…but I’m human. Which means, at times, I lose sight of His truth. A truth that tells me I can do all things through Christ; His Word that assures me I am never alone and we will be provided all that we need. Whether it be the right therapist, money to pay the bills, or strength to get out of bed in the morning…I will find it all in our Heavenly Father, who loves His children more than I could ever comprehend. When I finally reach the point of breaking down, and realize that I need to more fully rely on God again, I still find it extremely hard to accept any of the help He sends me. One of the ways that my recent prayers were answered came in the form of a referral for respite care. I knew deep down that I was barely keeping my head above water and I needed to accept the help. Yet, when I was asked if I needed it…I hesitated. I asked for time to think about it. Which is crazy, right?! Then why not jump at the chance? …Because it felt like failure. Because the voice of the enemy echoed in my head, telling me that I was running from responsibility, that I was weak, that I’d be judged by other moms, that the decision was selfish, and that I didn’t deserve a break. I’ve allowed those lies to lead my decisions in the past. I ran myself into the ground trying to take care of everyone but myself…and our whole family suffered for it. In the time between meetings, God shook me. He forced me to see that I was buying in to the lie that doing things all by myself was the key to successful motherhood. I’d watched my mother struggle to do it without help my entire childhood; always drowning in stress, yet turning down countless offers for assistance. I didn’t want to follow that path. I wanted to learn from it. 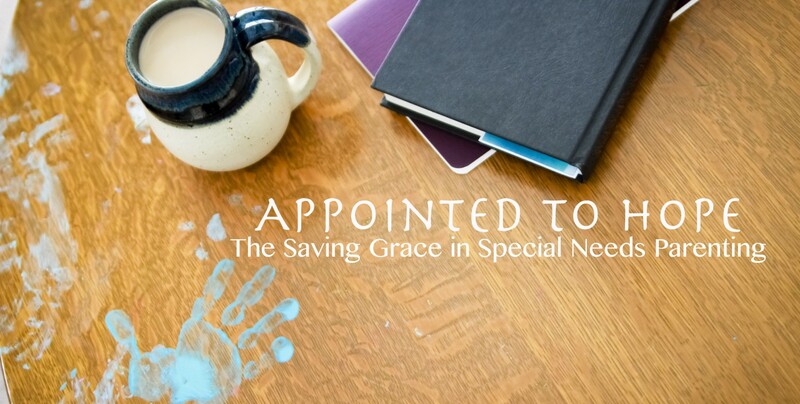 I’m not a victim of special needs parenting…I’m a recipient of the gift of special needs parenting. This gift has it’s share of challenges but, they’re not meant to handled alone. God designed us to be in community and to rely on one another; most importantly, to rely on Him. So, to believe that I was meant to push through the darkest times on this journey without help, is to believe that I don’t need God and He isn’t the provider He says He is; to live within the lie that His promises don’t apply to me. I couldn’t continue to embrace that way of thinking- I had to change it. So…today, while silently praying the social worker didn’t notice my hands shaking, I filled out the paperwork for respite care. I said “Yes”, when my mom guilt screamed “NO”. I faced my fear of letting go and decided to allow myself to hope for rest; for the space to breathe again. This service will be a first for our family, and I’m praying that it will help enable me to be a more successful, present and patient mother. That, by relinquishing some of the control I thought I had over our family’s struggles, I will strengthen my faith as I watch God work to help us through this difficult time. If you’re anything like me and you often feel the need to do it all on your own, hear me when I say: It’s okay to accept help in carrying the weight of motherhood. Whether you’re a special needs parent or not, don’t continue to run on empty. It will only steal your joy. Allow God to fill your cup, using whatever means (or people) necessary. Accepting help doesn’t mean that you’re weak. It means that you’re real. And real is what we all deserve the freedom to be.